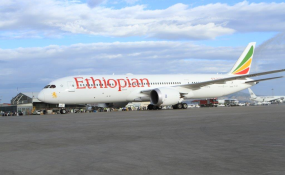 Africa’s First Ethiopian B787-9 at Addis Ababa Bole International Airport. The racism inherent in Western media's reportage of African tragedy, such as the Ethiopian Airline disaster, once again shows how important it is for Africans to support their own media. Tragedy is a human experience that no one can escape from. Yet the manner in which Western media report on death involving Africans remains infused with racism. Reporting on the Ethiopian Airline flight ET302 crash has proven to be no exception. The doomed flight had 32 Kenyans on board - the largest group from one country to perish in the crash. But reporting by the Western media displays all the tropes of "Africa, the dark continent", with media outlets such as Associated Press listing the countries of the victims in order of nationality, deliberately excluding Kenya and other African countries. The reportage by The New York Times on the Dusit bomb attack in Kenya was equally layered in racist tropes. In addition, a newscast by TRT World tried to pin the crash on Ethiopian Airlines having a poor safety record, a claim that aviation analyst Alex Macheras was quick to dispute and correct. Macheras said, "Ethiopian Airlines is an incredibly safe and trusted airline. This is not an airline with a poor safety record, as the presenter said." Incidents like these once again emphasise how important it is for Africans to support their own media and to tell their own stories accurately and effectively. They also shows the need to strengthen Africa's media in a continent where press freedom is still a big issue. The names of the 32 Kenyans involved in the crash were released by Kenyan authorities. The names of other nationals in the crash were sent to their various embassies. A total of 19 staff members of United Nations affiliated organisations were on board. For now, Ethiopia (and other countries) has grounded all its Boeing 737 Max 8 aircraft. Our deep condolences go to the loved ones of those lost in the crash.